Rex Tillerson grew up as a Scout in Troop 20 in Stillwater, Oklahoma. His father, a professional with the Boy Scouts of America, instilled the values of Scouting in Rex from an early age. 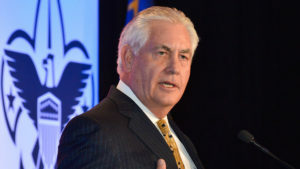 Rex Tillerson earned the Eagle Scout Rank at age 13 in 1965 and was later named a Distinguished Eagle Scout by the National Council of the Boy Scouts of America. In college, at the University of Texas at Austin, Tillerson was a member of Alpha Phi Omega, a fraternity which (at the time) only admitted Boy Scouts. He continued serving Scouting as a Cubmaster and Scoutmaster to his four sons, the youngest of which is a third-generation Tillerson family Eagle Scout. Tillerson served on the Board of Directors for the Boy Scouts of America and as the National President of the BSA from 2010 to 2012. In 2010 he received Scouting’s highest award: The Silver Buffalo presented to a volunteer. 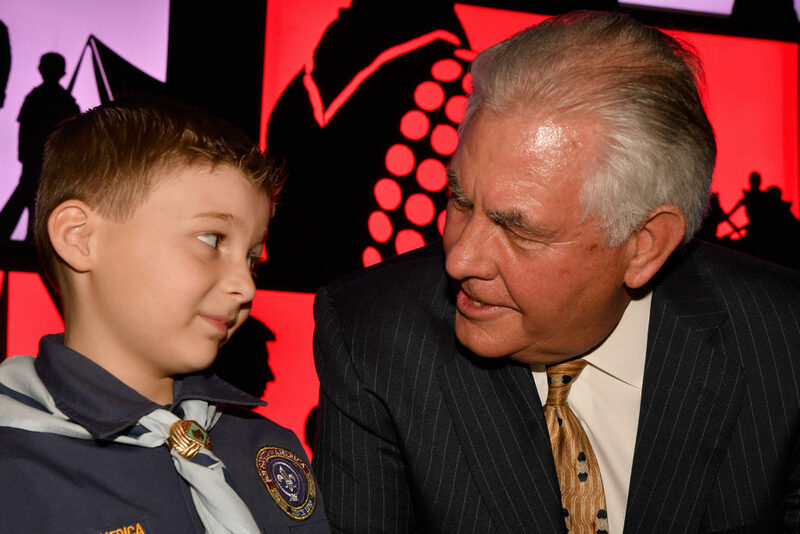 “It really was the values of Scouting that made me who I am and made me successful,” Tillerson told the audience. Rex Tillerson is an Eagle Scout and the former National President of the Boy Scouts of America. He currently serves as CEO of ExxonMobil. He has been nominated as the Secretary of State.